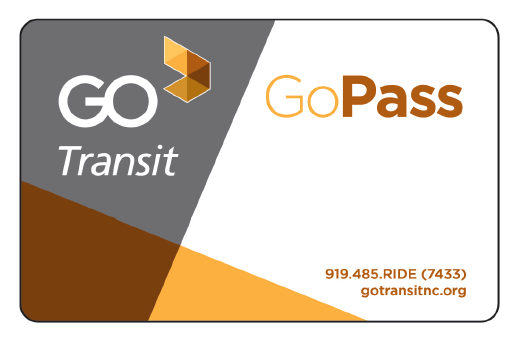 GoPass is a free transit pass offered to employees and tenants by the employer, property manager or developer. Tenants and employees ride for FREE for one year on all transit routes in the Triangle with any agency, when commuting to and from work. It’s a win-win benefit to offer as you are only billed for actual boardings at a fraction of the published transit fare. GoPass is available for and best suited to those considering over 100 employees for the offering. See below for a list of employers who offer exclusive subsidies and discounts on smart commuting options. Attract and retain tenants and employees in the city center with ample access to the workplace without the concern of parking. Get individuals out of the habit of commuting to and from work via single occupancy vehicles (SOV). Help reduce congestion and parking demand, while creating available space for customers, retail, and employer growth. Create a less stressful commute to work while saving gas, money, emissions, and improving air quality, also attracting individuals to this great region in which to live, work and play. Various organizations throughout the Triangle have already taken advantage of the benefits of the GoPass, including universities and colleges, State and local governments, property management firms and large employers. The list below contains a current list of GoPass partners, or talk to your outreach coordinator to see if GoPass is a fit for you. Advanced Energy (Centennial Campus): Learn more about the GoPass. American Tobacco Campus Tenants: Free GoPass! Unlimited rides on GoTriangle, GoRaleigh, GoDurham, and GoCary bus routes.Pick up GoPass with employee ID at ATC Security. Current ATC Tenants here. American Underground: Free GoPass! Unlimited rides on GoTriangle, GoRaleigh, GoDurham, and GoCary bus routes. Pick up GoPass with employee ID at ATC Security. Avalara: Free GoPass! Unlimited rides on GoTriangle, GoRaleigh, GoDurham, and GoCary bus routes. Pick up GoPass with employee ID at ATC Security. BASF: Discounted regional 31-Day pass. Purchase passes at the Regional Transit Center or the concierge's desk in the BASF cafeteria (no receipt will be given for flex account). BASF will pay $32 toward your monthly vanpool fare. Bronto Software: Free GoPass! Unlimited rides on GoTriangle, GoRaleigh, GoDurham, and GoCary bus routes. Pick up GoPass with employee ID at ATC Security. Burt's Bees: Free GoPass! Unlimited rides on GoTriangle, GoRaleigh, GoDurham, and GoCary bus routes. Pick up GoPass with employee ID at ATC Security. Campbell University: GoPass! Unlimited rides on GoTriangle, GoRaleigh, GoDurham, and GoCary bus routes. Centennial Campus Employers: Learn more about the GoPass. Citrix: Provides transit stored value fare cards for employees. City of Durham: Free GoPass! Unlimited rides on GoTriangle, GoRaleigh, and GoCary bus routes. Employees can use their employee ID badge for unlimited free trips on GoDurham routes. Pick up your pass at the City of Durham Transportation Department in downtown on the 4th floor. More info can be found on the City of Durham Intranet. City of Raleigh: Free GoPass! Unlimited rides on GoTriangle and GoRaleigh bus routes. Pick up your pass at the Public Works Dept: 222 W. Hargett St, 4th floor. Duke University: Free GoPass for students, $25 GoPass for employees. $10/month vanpool discount. $300 vehicle deposit for new vans with 50% or more Duke ridership. Registered vanpoolers also get 2 free daily parking passes per month. Bike Commuters also receive free Bicycle Benefits sticker and 2 free daily parking passes per month. Durham County Government: GoPass for $25/year. Ride any GoTriangle or GoDurham bus route that serves your office. Pick up passes with the Human Resources department - contact them at 919-560-7900. Durham County will pay $20 toward your monthly vanpool fare. Durham Technical Community College: Free GoPass! Free transit for students only on GoTriangle, GoDurham and GoCary bus routes for commutes to/from campus. Find out more about Durham Tech’s program here. FHI360: Free GoPass! Unlimited rides on GoTriangle, GoRaleigh, GoDurham, and GoCary bus routes. Pick up GoPass with employee ID at ATC Security. GlaxoSmithKline: GSK will give $30 each month toward the purchase of bus fares or passes. GSK will pay $30 toward your monthly vanpool fare. GoRaleigh: GoPass! Unlimited rides on GoRaleigh bus routes. GoTriangle: Free GoPass! Unlimited rides on GoTriangle, GoRaleigh, GoDurham, and GoCary bus routes. Free to ride any GoTriangle vanpool. Contact the vanpool department at 919-485-7462. Grifols: Grifols will pay $50 toward your monthly vanpool fare. James Scott Farrin: Free GoPass! Unlimited rides on GoTriangle, GoRaleigh, GoDurham, and GoCary bus routes. Pick up GoPass with employee ID at ATC Security. Kimley-Horn: Free GoPass! Unlimited rides on GoTriangle, GoRaleigh, GoDurham, and GoCary bus routes. Marbles Kids Museum: More information to come. McKinney at ATC: Free GoPass! Unlimited rides on GoTriangle, GoRaleigh, GoDurham, and GoCary bus routes. Pick up GoPass with employee ID at ATC Security. Meredith College: Free GoPass! Unlimited rides on GoRaleigh bus routes. NC Central University: Free GoPass! Free transit for students, faculty, and staff on GoTriangle, GoDurham, GoCary routes for commutes to/from campus. NC State Employees Credit Union: GoPass! Unlimited rides on GoTriangle, GoRaleigh, GoDurham, and GoCary bus routes for employees working at the 119 N Salisbury St location. NC State Government: GoPass for employees. Contact your Parking Coordinator or call 919-807-4499. State Govt. will pay $15 toward your monthly vanpool fare. NC State University: GoPass - $60 annually for employees or $5 annually for NCSU students. NCSU will pay $20 toward your monthly vanpool fare. NIEHS: NIEHS will give $265 each month toward the purchase of vanpool or transit fare. North Ridge Country Club: Free GoPass! Unlimited rides on GoTriangle, GoRaleigh, GoDurham, and GoCary bus routes. Pfizer: Pfizer will pay $50 toward your monthly vanpool fare. Progress Energy: Progress Energy will give $20 each month toward the purchase of bus passes or vanpool fare. Red Hat: Free GoPass! Unlimited rides on GoTriangle, GoRaleigh, GoDurham, and GoCary bus routes. Redwoods Group: TRG will pay $110 toward your monthly vanpool fare. Research Triangle Foundation: RTF will give $64 each month toward the purchase of bus passes or vanpool fare. Research Triangle Regional High School: Free GoPass! Unlimited rides on GoTriangle, GoRaleigh, GoDurham, and GoCary bus routes to and from the RTP campus. RTI International: RTI will give $255 each month toward the purchase of vanpool and transit fare. Stewart: GoPass! Unlimited rides on GoTriangle, GoRaleigh, GoDurham, and GoCary bus routes. Suntrust at ATC: Free GoPass! Unlimited rides on GoTriangle, GoRaleigh, GoDurham, and GoCary bus routes. Pick up GoPass with employee ID at ATC Security. Town of Cary: Free GoPass! Use Town Intranet under ‘Employee Benefits' for the GoPass Application. Triangle J Council of Governments: TJCOG will give $50 each month toward the purchase of bus passes or vanpool fare. UNC Chapel Hill & UNC Hospitals: Free GoPass for unlimited rides on GoTriangle, GoDurham, GoRaleigh, and GoCary bus routes, or a $30 discount for vanpools. Join CAP to register for these discounts and other benefits. US EPA: EPA will pay up to $265 toward your monthly vanpool or transit fare. Please register on the EPA-RTP intranet. VA Medical Center: The VA will reimburse up to $255 toward employee's monthly transit pass or vanpool fare. Wake County Government: Free GoPass! Unlimited rides on GoTriangle, GoDurham, GoRaleigh, and GoCary bus routes. Wake County will pay $30 toward your monthly vanpool fare. Wake Technical Community College: Free GoRaleigh GoPass for current students and employees with valid Wake Tech ID. Valid Monday through Friday on ALL GoRaleigh routes. Pick up your pass at any of Wake Tech’s ID offices. Visit greentrek.waketech.edu for more information.